The workshop gave the participants an insight into the intermediate results of the projects of the „CrowdAnalyser“ graduate school at Heidelberg University. Gennady Andrienko (City University, London, UK) delivered an invited keynote talk. 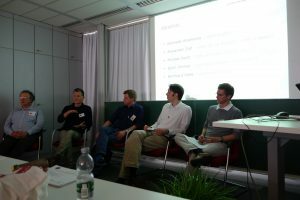 In addition, a panel consisting of Alexander Zipf, Bernhard Höfle (both from GIScience, Heidelberg), Björn Ommer (HCI, Heidelberg), Michael Gertz (Database System Research, Heidelberg) and Gennady Andrienko (City University, London) discussed recent methodological issues as well as the potential of crowdsourced geographic information.